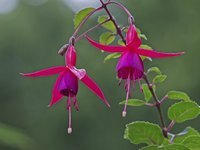 Fuchsias (Fuchsia spp. ), hardy from U.S. Department of Agriculture plant hardiness zones 7 through 11, usually are propagated from cuttings because hybrid types don’t come true from seed. However, the seeds of varieties such as tree fuchsia (Fuchsia arborescens, USDA zones 9 through 11) should produce plants identical to their parents. Some gardeners may also enjoy creating their own new hybrid by crossing two existing varieties and harvesting the seeds produced from that mating. Look for berries to mature on your fuchsia plant about two months after the flowers were pollinated. In most case, those berries will turn a dark purple when ripe, though they occasionally may remain green. To protect them from birds, cover each one with a small muslin drawstring bag. Once the berries feel soft to the touch, they are ready to pick. Slice each berry lengthwise and look for seeds, which usually appear in a channel near the berry’s outer circumference. Those seeds are tan or brown and quite small, often no more than 1 to 2 millimeters long. Using the tip of your knife, gently scrape them out of the channel and spread them over the surface of a paper towel. If you wish to sow them right away, allow them to dry overnight. Should you plan to store them instead, leave them on the towel for about a week. Because the seeds come enclosed in gel, they may stick to the towel once dry. In that case, carefully scrape them off with the blade of a blunt table knife, fold them up inside a piece of coffee filter and seal it inside a small zip-type plastic seed envelope. When you are ready to sow the seeds, make a 500 ppm, or parts per million, solution of gibberellic acid, also called GA-3, by allowing 100 milligrams of GA-3 powder to dissolve in about 1 cup of distilled water overnight. Pour a small amount of the solution inside the plastic seed envelope -- just enough to wet the coffee filter -- and seal it up again for 24 hours while the seeds soak. Although GA-3 does raise the germination rate, its use is optional. If you don't have access to it, soak the seeds for 3 days in rainwater instead. At the end of that time period, fill a pot that has drainage holes with moist seed-starting mix, stopping 1/2 inch short of its rim. Sprinkle 1/8 inch of damp sharp sand over the surface of the mix and press your seeds into the sand without covering them. If you used GA-3, top the pot with aluminum foil to keep its mix dark and damp. Otherwise, cover it with plastic wrap to maintain its moisture, and place it under the end of a grow light. In either case, temperatures should remain between 65 and 75 degrees Fahrenheit until the seeds begin to sprout, which can take from two weeks to four months. At that point, remove the container's foil or plastic wrap and keep the seedlings in a position with bright light but no direct sun.